It's been a while since I've chopped vegetables . 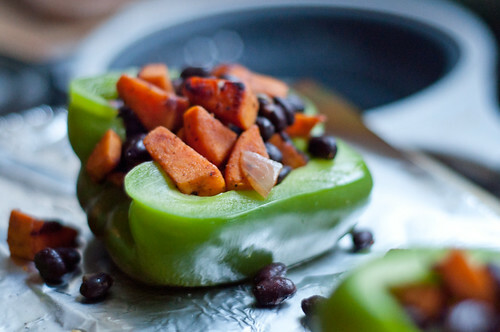 . .
Roasted peppers . . .
Splashed in secret (well, not-so secret) ingredients . . .
Set your oven to broil. 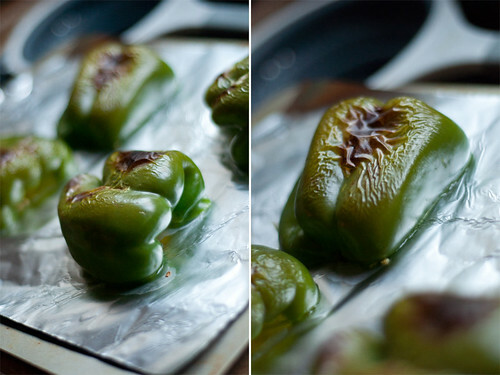 Line a cookie sheet with aluminum foil and place your green pepper halves on it -- cut side down. Broil for 10 to 15 minutes, until browned on tops and softened. 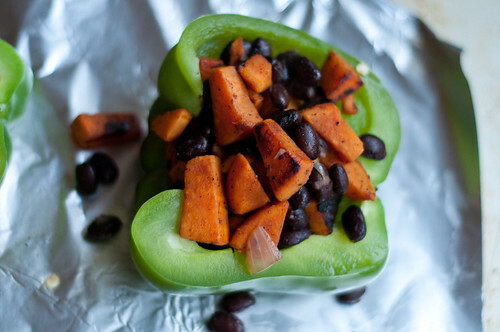 In a large pan over medium-high heat, toss in your olive oil and sweet potato chunks. 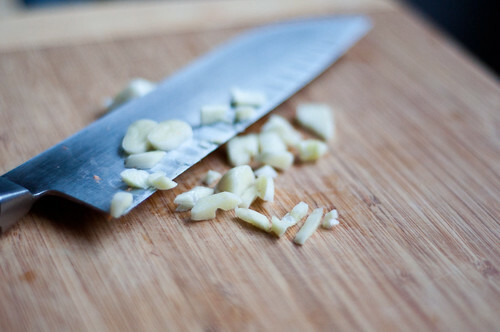 Cook for a few minutes and then stir in the apple cider, black pepper, garlic, and onions. Cover and lower heat just a bit -- 5 minutes. You want them to get slightly blackened on the bottoms. Add more oil to the pan if it's dry, but then add black beans. Cook for another 5 (or so) minutes until everything is softened. Test the sweet potatoes especially. Your green peppers should be cooled by now, flip them over so the cut side is up. 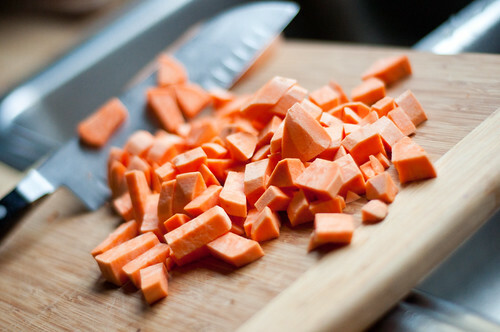 Then fill each with a generous scoop of the sweet potato mixture. Top with cheddar cheese if you wish. Then place in oven -- which should still be on broil -- and cook until cheese is brown and bubbly. Let cool to warm before serving. I've burned the roof of my mouth before stuffing these down my throat. We've made many different types of stuffed peppers before, but this recipe was -- for whatever reason -- the most satisfying and filling. 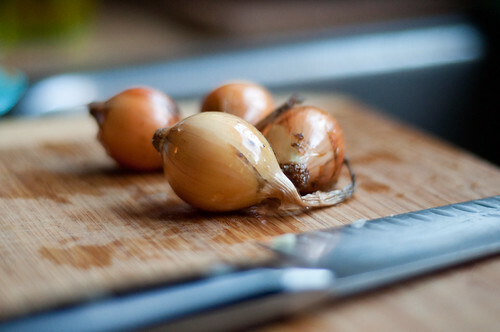 We even used onions (the tiny ones in the photo above) from our own garden. Score! NOTE #1: If you don't have apple cider, water would work as a good substitute. 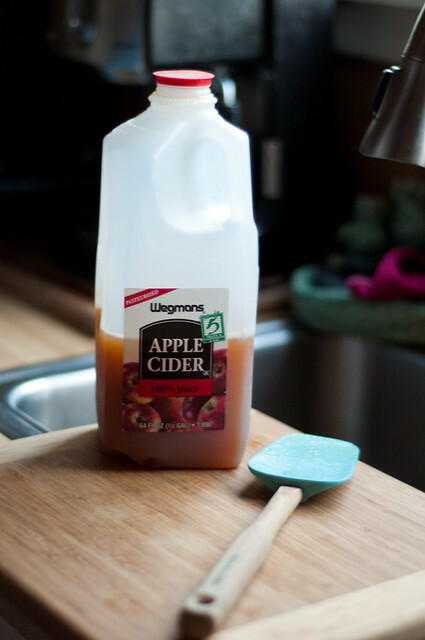 The sugars in the cider, though, help blacken and flavor everything. I love hiding cider in all my fall foods. If you haven't checked out the Hidden Cider Cookies yet, I recommend you do! 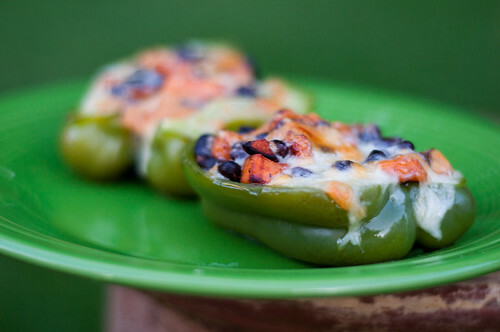 NOTE #2: Top peppers with hot, hot, hot sauce for best results.